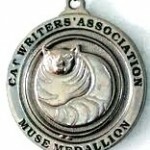 We are very proud that Little Big Cat won the coveted 2011 Muse Medallion Award for best website, from the Cat Writers’ Association. You may remember a few weeks back that, along with our good friends Ingrid King of the Conscious Cat and Mary Ann Love-Miller of Feline Express, we won a Certificate of Excellence. 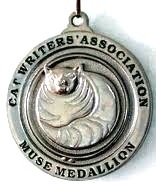 Then those 3 sites competed for the Big One — the Muse Medallion — and we are so honored that Little Big Cat was chosen the winner among all the amazing competition! Little Big Cat began in 2001 as a project between holistic veterinarian Dr. Jean Hofve and cat behavior expert Jackson Galaxy. Our goal was, and remains, to make cats’ lives better though education. Thanks to all our readers for your comments and support over the years! ← Declawing Cats Required to Rent?